Human-wildlife conflict frequently involves carnivores, mainly because of their large home ranges and dietary requirements. As such, carnivores tend to be the first animals to be lost in human-dominated ecosystems. This is significant because the removal of carnivores can alter the functionality of ecosystems. However, the conservation of carnivores depends as much on the socio-political and socio-economic landscapes as it does on the ecological one. The consolidation of vast, un-fragmented conservation areas in Africa and the world is unlikely. Thus, unravelling the factors (both biological and sociological) responsible for and influencing human-predator conflict is critical for carnivore conservation. The Winterberg district in the Eastern Cape, South Africa has been a sheep (Ovis aries) farming stronghold for nearly 200 years. Consequently, conflict between farmers and predators is commonplace and depredation of livestock by caracals (Caracai caracal) remains a perennial problem. However, the extent of this human-predator conflict (including a reliable assessment of caracal density) has not been quantified. This study used camera trapping to estimate the density of caracals (a noninpidually recognisable species) in the Winterberg and a structured questionnaire to gauge the general attitudes of the farmers of the region. 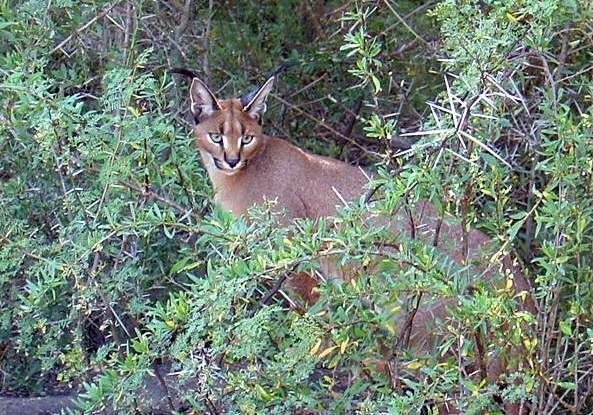 Caracal density was estimated to be 0.20 caracals/km². This estimate equates to a population of approximately 54 caracals across the entire district. Therefore, caracals do not appear to occur at high densities in the Winterberg. However, the survey of the residents of the Winterberg Conservancy revealed that predators were rated as the greatest problem faced by farmers in the area. Although not significant, it also showed that the size of a respondent's property and sheep mortality due to caracals had the greatest probability of affecting attitudes towards predators. The farmers lost less than 10% of their stock to caracal depredation on an annual basis. Therefore, the general perception that predators were the most important factor in stock loss in the area does not appear to be fully supported by my data. The Winterberg is a male-dominated, multigenerational society and it is likely this propagates certain perceptions towards predators which are a reflection of long-held family traditions and beliefs. Such situations can result in reactions which are disproportionate to the actual scale of the problem. However, my study was limited to a sub-set of the landowners in the Winterberg. Thus, more intensive assessments of caracal space use and community attitudes towards predators are recommended.